The great thing about being a kid today is the wide range of play experiences available. Thanks to the pioneering work of Eric McMillan, known as ‘the father of soft play’, we now have the indoor playground. This has been a revolutionary concept in early education. This is where children learn to discover the world through play. Even toddlers can develop their social and cognitive skills like never before. Of course, kids shouldn’t need to go to an indoor playground to have a good play experience. You can set up a play area in your home with some interesting toys like a ball pit and a slide. Your kids can play safely and stay absorbed for a reasonable length of time. This allows parents can get on with their work, while keeping a watchful eye on the kids. What could be better than that? 1.13 What are the Benefits of Playing with a Ball Pit? One of the joys of parenting today is the sheer variety of toys available. It makes you want to return to your childhood to enjoy the fun. But the drawback? How to make the right choices. Every child and family is unique. Needs differ from one to another. The choice is huge. Here’s what to consider when choosing a ball pit for your toddler. Dimensions: Size definitely counts. Toddlers love ball pits, but kids come in all shapes and sizes. What suits a one-year-old won’t necessarily suit a more mature pre-schooler. The number of children to play is also a deciding factor. And most important, the pit should fit comfortably into your home space. Materials used: The materials used to make the the toy should pass all the safety standards and feel comfortable for the children. Style: Pop up style may be easier to manage and put away, but inflatable models may be more solid. We’ve done the leg work for you. We checked 12 popular picks to help you to decide which one suits you best. So read on and decide for yourself. This isn’t just a pit. It has several parts, which can be used together or separately. It consists of a pink castle tent, with a tunnel linking to the ball pit. And this is very much a girls choice. You could even say a princess ball pit. There’s a little dress up costume in the set, although the balls must be bought separately. The style is pop up and the feedback from parents and their little girls has been mostly positive. The little girls just love the lights and glow- in-the-dark stars. The parents find it easy to assemble. Parents say it’s hard to get the girls out of the castle once they’re in. It keeps them absorbed and they totally love it. Drawbacks? One parent mentioned that the material is rather thin. She recommended laying down a rug underneath because of that. This is an inflatable pit for toddlers, from age 2. It has an attractive appearance and looks like a toy train when inflated. 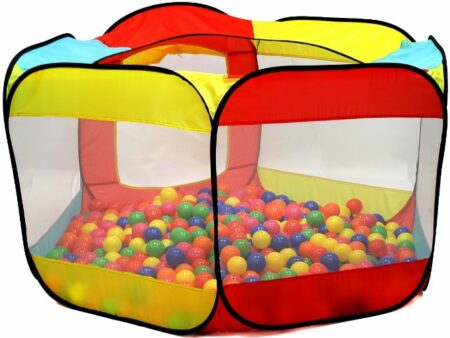 As an indoor ball pit for toddlers, it ticks all the boxes where safety is concerned. It could be an outdoor toy in fine weather, with parental supervision. It has a set of 25 kids ball pit balls, but parents need to buy some more balls to fill up the toy to its potential. It has a secret entrance and kids enjoy crawling in and out as they please. Parents should check for punctures and keep sharp objects away. Feedback has been mostly positive. Some parents find that it takes ages to inflate. Others complain that it only comes with 25 balls. But balls are generally bought separately from the pit, so this isn’t a huge issue. This is also an inflatable pick for toddlers, which can double up as a pool in the summer. 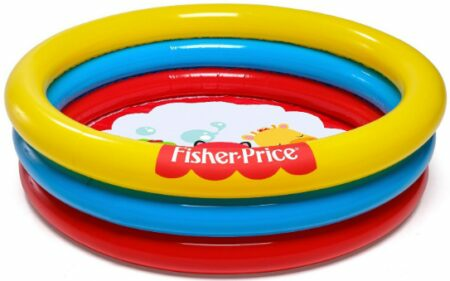 Another inflatable toy from Fisher Price, this one is attractively colored and lots of fun for the youngsters. This comes with a small number of balls and it’s necessary to add to the amount of balls to maximize the fun. The cool pit pool can be filled with water or balls as desired. The set also comes with a repair patch, which reminds us that inflatable toys, while comparatively sturdier than the pop up type, have a risk of puncturing. Of course we can try our best to minimize that, but it still happens. There are some glowing reports for this. The kids love it. One mother claimed, it doesn’t easily puncture and stays inflated for months, once the item is inflated. 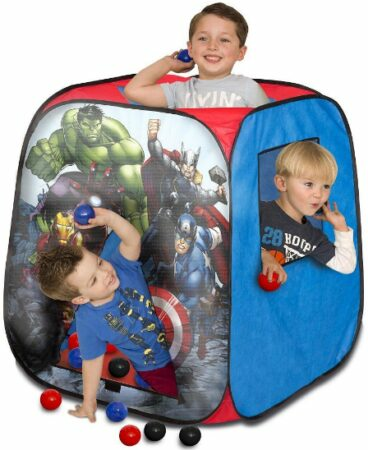 The Avengers’ Playhouse will give your child and his friends hours of fun. The product is stated to be suitable for children of three years old and over. But according to reports, children even younger than that appear to be enjoying it. The pop up design means that it can be folded and unfolded easily. This means it can be put away with minimum fuss when playtime is over. This is useful for parents when they’re tidying up afterwards. Better still, if the kids are slightly older, they can help put it away themselves without any problem. There are mixed reports about its durability. While one mother claimed that it didn’t even last for two hours, another mother claimed that it’s holding up well considering her kids are two hardy 5 and 6 year olds. But the product’s performance seems to be good overall. Ball, tunnels and pop up tents! Just add lots of kids ball pit balls. This set has some raving fans. The price is affordable, it’s easy to assemble and the material is good quality and easily cleaned. It comes in its own pouch, in which it can be easily stored. An average adult can get fit in, if necessary. The kids love it. However, one word of caution: this toy is considered unsuitable for kids under three because it has some small parts. So keep your kids under supervision when playing. Also, it occupies a fairly large space in the home. Some parents get around this by using the set in the house and setting up the full set in an outside yard during warmer weather. It’s not necessary to put up the whole five pieces every time. It can be set up in different configurations. 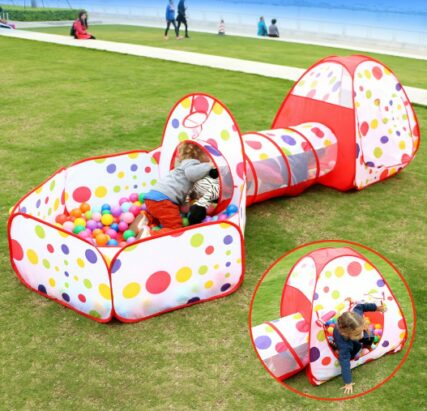 This attractive, brightly-colored tent gives children hours of fun. It can be used as a ball pit or a play house, the kids can choose. It has an entrance so the children can move in and out themselves. It’s a pop up tent, so very easy to assemble. It’s also durable and easy to clean. It is spacious inside and quite compact too. The design is simple. The tent is colorful. It’s one of the best picks for toddlers as it’s spacious and easy to exit. The manufacturer recommends that parents should fill this tent with about 400 balls. If you want something simple to keep the kids busy for hours, this is it. Kids love it as it’s a fun toy and parents love it because it’s economical, durable and easily stored. 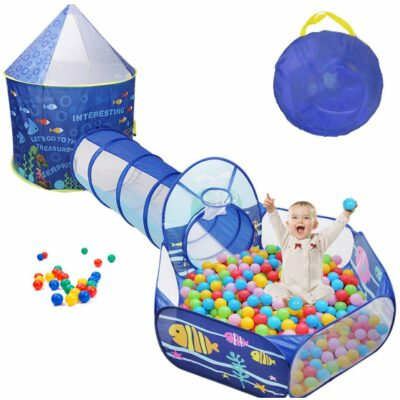 This is a three-in-one set, with a tent, a tunnel and a ball pit. It’s perfect for your back yard or open space in fine weather. It can be used indoors too, if space allows. Light and easy to assemble, the kids will have tons of fun in this. The three different areas can be used together or separately, depending on space available and play requirements. The material is durable and easy to clean. Young children can’t get enough of this play set. One word of caution, though. This tent and pit fills all the safety requirements, but it is recommended that children should be supervised at all times when using any such toy. The plastic balls for use must be purchased separately. Make sure to buy at least 400 balls in order to fill the pit deep enough. This is an attractive playpen which can also be a ball pit. It can comfortably hold two toddlers and keeps the little ones busy and happy. It’s accessibly priced and easy to assemble. Children love this ball pool. They can have fun and develop their motor skills by throwing balls through the attached basketball hoop. However, this product has caused problems for some. All childrens’ products come with an instruction that children should always be supervised when using it. Several parents supervising their children in this playpen have reported that sharp wire was used in the product. Had the children not been properly supervised while using this, there could have been several nasty accidents. Be sure to check the ball pit before using to ensure the wire has not come through the fabric. Children’s toys are produced according to strict safety guidelines, but parents still need to supervise just in case. This is a princess pick and as it has a very girly design, it’s especially for little girls. It’s in one piece and is good for indoor and outdoor use, depending on the weather. It can be assembled in a limited space and can be taken down and put away quickly. It can be set up numerous times without any problem. It’s also extremely durable. For little girls who dream of being a princess, it’s their castle. 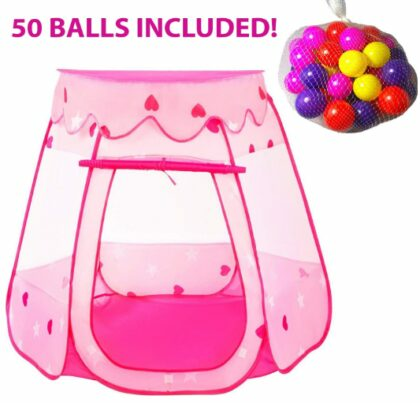 This princess ball pit comes with 50 balls included, although you will probably have to buy more to maximize the fun. Some children love to bring in their toys and even sleep inside. It’s a perfect gift for any little girl of one year or over. Some parents have reported it to be really good value for money too, as the price is reasonable and the product fulfills all expectations. This is an inflatable tent with many attractive and colorful details, which include the Disney cartoon character Mickey Mouse and other cartoon characters associated with him.. This one can double up as a Mickey Mouse pit. Because it’s associated with a company like Disney, users expect a high quality product. As with all toy pits, one has to buy the balls separately, although a few balls are provided. The product seems to be very much liked by children, which is most important. As it consists of a single piece, it can be assembled even in a limited space. Overall, the verdict on this toy is positive. The toy is fine, but it is necessary to purchase extra balls if you wish to use it as a playful pit. Kids will love throwing the balls through the spaces on the side of the tent. This set is big enough for playschool or a kid’s party. With three play tents, three crawl tunnels and a basketball pit, it needs space to be set up fully. It can be assembled outside on summer days and inside in different configurations during cold weather. One thing is sure – children will never get bored in here! Made of child-friendly material with breathable mesh, it’s safe for children, although it’s always good to supervise children using play equipment. 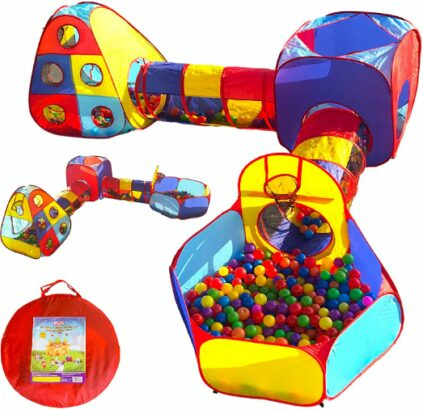 This is one of the best ball and pits for toddlers, and also includes a small baby pit for the little ones. Some users dislike the fact that the balls must be bought separately. Many parents rave about the product’s sturdiness, saying it is hard wearing and made to last. 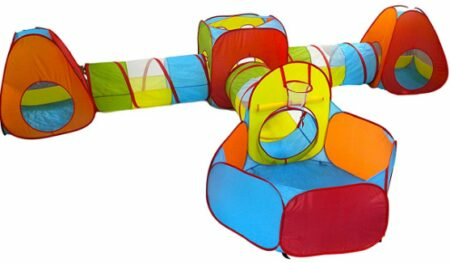 This play castle with crawl tunnel and fun pit is very popular. All the three pieces of the set can be used separately, but together, they make up a superb play castle. This toy has some raving fans. And though it can serve as a baby pit, it is always wise to accompany your child when using play equipment. It’s good for babies and toddlers alike and can keep them amused for hours. The materials are baby-friendly, so the set is safe for kids of any age. It’s also a very attractive play set with a vibrant color. It’s good for boys and girls, babies and toddlers, however, the balls must be purchased separately. Supervision of babies and young children is essential, although the toy is safe. What are the Benefits of Playing with a Ball Pit? Social Skills: As kids play together, they develop social skills. They learn how to interact together and cooperate. A kid who constantly demands his own way won’t be the most popular toddler in the ball pit. The child learns what works and what doesn’t in his interactions with others. Motor Skills: While having fun in the ball pit, the child recognizes a red ball. He loves the color. He reaches out and grabs the ball, then throws it in the air. Without being aware of it, he’s mastering hand/eye coordination and improving his motor skills. Of course, all the bright colors will fascinate your toddler and he will soon learn to name them all too. Fun and relaxation: Children enjoy the fun and wonder of their world of play and are obviously happier and more relaxed individuals as a result. Ball pits are wonderful for children on many levels. But there are some things you must consider before letting your kid play in one. Supervision: As mentioned earlier, children’s play must always be supervised. You may buy the safest toy in the world with raving reviews, but you might get the one copy that has a fault. And as we’ve seen earlier, parental supervision has averted many a tragic incident. While children may play energetically in these wonderful indoor playgrounds, there is no substitute for having a responsible adult on the scene. Remember Their Limits: Toddlers differ from each other in age and size. A one-year-old child wouldn’t have the capacity of a three-year-old. Keep this in mind and don’t fill the ball pit too deep for very young children. If you notice your child is struggling, just take him or her out. They may have had enough for now. They can go back again and play later. Remember, what’s good for your child may not be good for another. Whatever suits you and your child is the right one for you.